For one thing, this acquisition of Goldcorp will be a slow and drawn out corporate process. People will be let go and projects will be shelved and sold. But what does it mean for junior gold speculators? The two recent mega mergers will limit investments into juniors by the majors and takeovers, as the big two (Barrick 2.0 and Newmont) execute their synergies and divestitures. In the table below, let’s take a look at the significant stakes in smaller gold companies that Newmont currently owns. At most, Newmont will maintain their interest in any future financings. But after this week, another $1 billion in acquisitions won’t be at the top of mind for Newmont. Anyone with an internet connection these days knows how strong the U.S. stock market has been over the last 9 years. Cheap money fueled an exceptional rally that drove indexes to new highs. But financial heroine (cheap money) only can last for so long. And when the junkies can’t get their fix, look out. The financial withdrawal that the global markets will experience will be unlike anything ever experienced. Just like junkies, the previous dose won’t get the same high. And the debt levels are near O.D. (overdose). In December 2018, there was a mass exodus of capital from the major U.S. indexes. Selling pressure was fierce and led to the first negative year for the S&P 500 since 2011. I have long said that gold and gold stocks should make up a portion of one’s investment portfolio. Especially during periods of economic uncertainty. President Trump shut down the government over a fight about building a border wall in Mexico (power politics at play). Meanwhile, he’s also in the middle of a trade war with China. The markets are uncertain. Gold is certain. Gold has lasted thousands of years and will last another thousand. 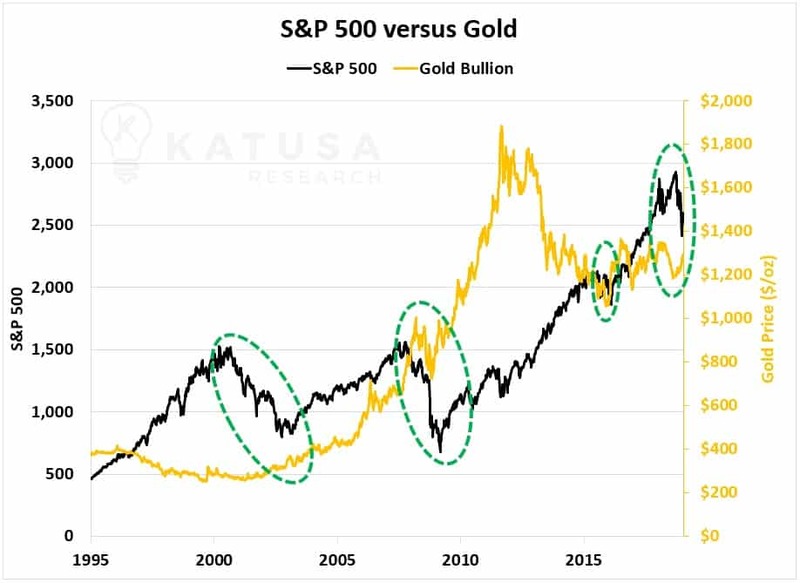 Below is a chart which shows the historical returns for gold and the S&P 500. You’ll see that in all the major corrections over the last 20 years, gold has been a strong performer. The historical use for gold was as a hedge against disasters, whether they be political or economic. And it can pay off during turbulent times as shown above. I’ll be the first to admit, gold has been a lousy sector to invest in over the past 5 years. Even with massive ten baggers on Northern Dynasty and Newmarket Gold (which became Kirkland Lake), its been a market that has tested my own testicular fortitude. And Patience. My big bet on Nevsun Resources played out well. But I’ve had some smaller bets that haven’t worked out and I cut my losses and moved on. We are big fans of looking at sentiment. We want to know who’s talking about gold and how they’re talking about it. And we have just the tools to tell us. Right now, our sentiment indicators are flashing a massive green light. It’s showing an upwards spike in gold sentiment. In fact, over the last month positive mentions for “gold” and “gold stocks” have achieved a 65% increase over the month previous. This coincides with a rising gold price and the price of gold equities. Gold stocks could just be the #1 investment of 2019. And a prudent investor or speculator needs to be positioned accordingly. Long-time readers know I’m a big fan of holding some physical gold and even silver. But there’s a much, much better way to profit off a rising gold price. And that’s by holding underlying gold equities. And with the recent $10 billion takeover of Goldcorp by Newmont, it sets the stage for a massive shakeup of efficiency in the industry. The best will get better and this news will spark massive interest in what’s next. I’ve got in-depth research on every publicly traded gold producer in the world. It doesn’t give me a crystal ball but it narrows the field big time. I have an extensive rolodex with the best management teams in the business. Proven teams that have discovered, developed and operated world class operations. With gold spending much of 2018 under the radar thanks to Bitcoin and Marijuana, its recent move is getting attention. The time to pick up gold stocks is before they make their next 50%, 100% or 300% move in short order. That’s when a much wider audience will look to jump in. Volumes will swell, traders will come in and you’ll see gold newsletters coming out of every corner. But there’s still a window to scoop up the best of the best gold companies before that happens. And that’s exactly what I’m doing with millions of dollars of my own money. I am buying world class assets, in the top jurisdictions, with the best management teams. If we’re at the start of a major rally in gold, look out. 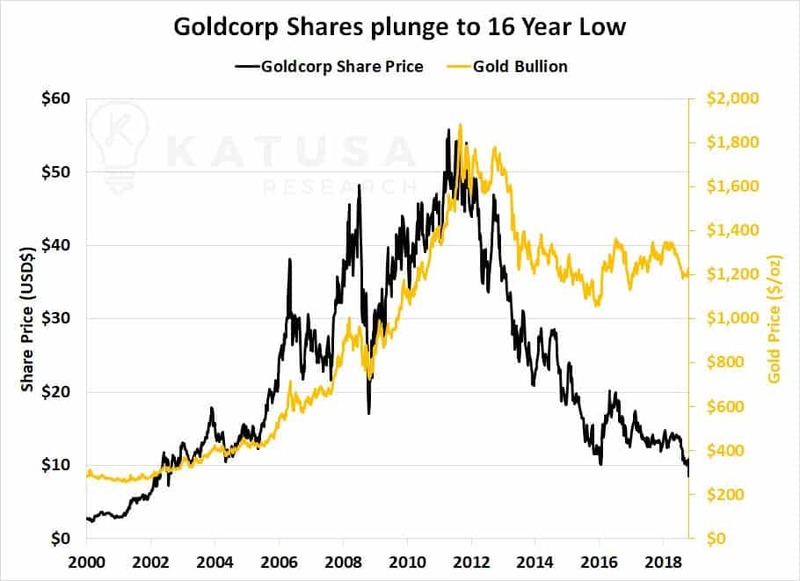 In the February issue of Katusa’s Resource Opportunities, I am publishing the details of two gold companies I believe will be bought out in 2019. And what price to buy those two companies. I plan on having myself and subscribers positioned to profit, so make sure you are too. And I will be putting even more money into select companies over the coming months.